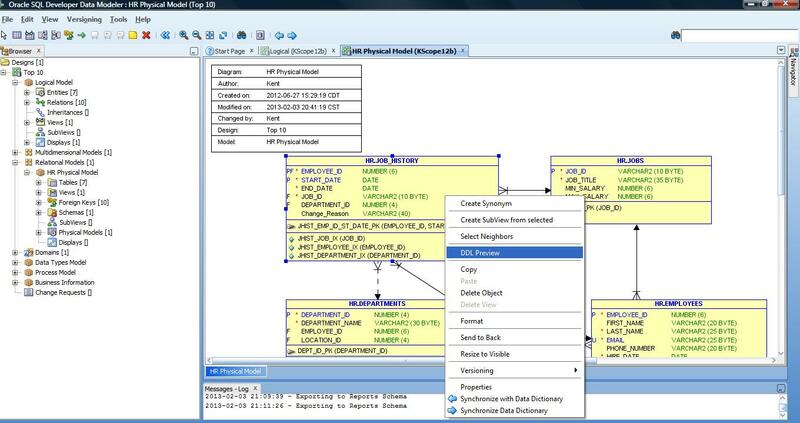 Oracle just released the latest and greatest version of SQL Developer Data Modeler (SDDM) and it is free to the world to not only download but to use in your production environment to develop all your models. As many of you know, I have been using this tool for several years now and have mentioned it many times on various LinkedIn forums (just search for me and check out my activity). I have used SDDM for both Oracle and SQL Server. For forward engineering and reverse engineering. For conceptual, logical, and physical data models. I think it is a great tool (even if it was not free). I loved Oracle Designer and got quite good at that, but once shops stopped buying and using Designer (and Oracle pretty much sun-setted the tool), I suffered for a few years using other tools. 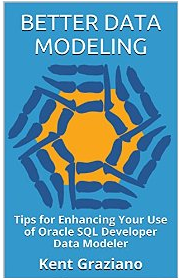 I was a very happy camper when Oracle came out with this new data modeling tool. I am even happier now with the new features they have added. The one I like the most, so far, is the visual editor they added for defining views. The previous version had a decent declarative approach that allowed you to specify tables, columns, and joins, but you could not really “see” the implied data model. The newest version of SDDM (version 3.1) has added in a visual editor that shows you a diagram of the tables, columns, and joins. So now when you open (or define) a view and press the “query” property button you get drag and drop interface to build the view and a nice visual diagram. And the best part is when you upgrade your existing models from previous versions, the old views automatically get diagrammed. To get the best out of the new version you need to run a one time utility labeled “Parse Older Style Views”. You can find that off the right mouse menu in any diagram with views. It runs very fast and basically reads the SQL for your views then parses it out to show up properly in the diagram. One nice new feature with the parsed views is that if the underlying tables in the view are part of the same design file (hopefully you did not drop those), then the view object on your diagram will now list those tables below all the columns. This is nice because now I do not have to open the view definition to see which tables the view is pulling from. The other great new feature is the “Test Query” button on the view property dialog. No more writing views that do not work. You press the button, specify a database connection to use, then the base query for the view fires. If there is an error in your syntax, or a table you don’t have access to, you find out immediately. So gone are the days of writing the view in your modeling tools, loging into SQL Plus or SQL Developer, testing the view, having it fail, then going back to SDDM to fix it. Now you can do agile view development! In one tool! Oh, and if the view works, there is a data tab so you can see the actual data the view will produce – live. Right in the data modeling tool. Convinced yet? Head over to the Oracle site and download your own copy and give it try. And I even have a tips and tricks Kindle book out on SDDM. You can find that here. Let me know what you think in the blog comments. P.S. For all the new features in SDDM 4.1 check out the full list over here. P.P.S Need training on SDDM? Check out my post about my new workshop. I haven’t looked at this version of the tool myself, but it definitely looks worth checking out if you only want to model databases. Navicat just released a Navicat Data Modeler. It has a free version. I’ve tried many different data modelling tools and found this one is more user-friendly and powerful. Thanks for the heads up but according to the press release only the trail edition is free for 30 days. After that it is $99 or $249 depending on which version you want. What database are you using it with? Have you tried Oracle’s tool? It is free forever and is a version 3.x not a 1.0 so it may have some features Navicat does not. I would be very interested in seeing a comparison of features between the two tools. I’m a beginner at this and looking for a simple tool to create a (visual) logical data model in, to capture the business requirements on data to be stored and relationships between data. The output will be used as input to a DBA/dev building the actual DB. Is this tool also usable if you want to build the DB in mySQL rather than Oracle? Maybe this tool is overkill for me, what do you think? No, this tool is not overkill for you (or anyone really). When you develop both logical and relational models in SDDM, they are not associated with a particular RDBMS type, so you should have no problem creating a visual diagram that would be usable for your purposes. I can’t see that the tool generates DDL for MySQL yet, but since Oracle owns it now, I would expect to see that in the future. That said, with the various DDL options in the tool you should be able to generate something that will be close enough for your MySQL DBA to use as a starting point. For other databases like Oracle amd SQL Server, you will be able to hand working DDL over to the DBAs for sure. I just downloaded version 3.1.1 and have been doing some research on how it works. I discovered your blog. The tool looks good and I think it will meet my needs. I’ve been doing data modeling for about 30 years and over that time I’ve used a variety of tools. Recently I’ve been using VISIO, ERwin 4.1.4 and System Architect. As a self employees consultant I haven’t been able to justify buying ERwin 8.2. Also I like the Baker notation (I’m a fan of Dave Hay) and SDDM supports that. As you said, the price is right. My issue not is learning to use it. The Oracle User’s Guide is not very detailed. While I can probably learn by doing, I’d prefer to save time by reading up on its features and nuances. I haven’t been able to anything on the web, nor could I find any books on Amazon. Does anyone know of a how-to book for SDDM? Thanks for the comment. I hope you find some of my posts helpful! Not only am I fan of Dave Hay, but he has been a friend and mentor since early in my career (and now I see him occasional at the Houston DAMA meetings). Also a fan of Barker notation – I even got break bread with Mr. Barker on several occasions at some early Oracle user group conferences. As for books on SDDM – sorry none that I know of. Sue Harper wrote a book on SQL Developer a few years back that I think had a few bits one the modeling tool. Your best bet for a fast start is the free demos on Oracle site. The OTN forum for SDDM is also fantastic for getting problems resolved. The development team is very responsive. Kent, thanks for you reply. I joined the OTN forum earlier today and I probably make use of it. I got to know Dave Hay back in the late 1980’s when he and I were members of the Compuserve CASE forum. I guess my way ahead will be to experiment with the tool and ask questions on the OTN forum. Thanks again. In the Oracle Learning Library (OLL) there are 54 Web-based trainings on SDDM. If the following link doesn’t work, just search OLL using the Advanced Search tab, specifying SQL Developer Data Modeler in the Product field. You can narrow your search to Releases 2.0, 3.0, or 3.1 in the Release field. I’ve tried SQLdbm which is also free and offers you an easy, convenient way to design your database absolutely anywhere on any browser, working away without need for any extra database engine or database modelling tools or apps. Use SQLDBM to design and manage both large and small databases and data models on the fly. All while incorporating any needed database rules and objects such as database keys, schemas, indexes, column constraints and relationships. Thanks for sharing. I had not heard of this product. Are you one of the developers? I see it is Beta and only supports SQL Server. It would be great if it supported Snowflake too. Even better if it could connect to a database (cloud or on-prem) via JDBC to reverse engineer an existing model.